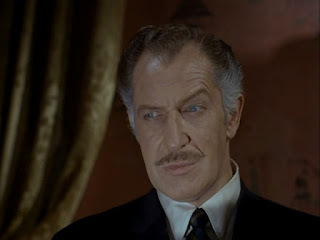 If pressed to name a single actor who just means "horror movie" in my mind, it would be Vincent Price (with Christopher Lee and Peter Cushing close behind). He was just so versatile within the genre, it's almost difficult to appreciate just how many facets he was able to demonstrate, yet still remain true to the horror film. While he is mostly known for being urbane and gentlemanly (and that would be his default character mode for his career), he could still present an air of menace with little more than a glance or sneer. He could switch in one moment from a rather foppish gentleman into a leering depraved maniac (House of Wax). He was also noted for his adaptations of Poe works (House of Usher, the Raven, etc.). His aptitude for comedy was enormous, and even when he was playing a straight role, as in House on Haunted Hill, his comedic asides were essential in breaking the unrelenting tension and setting up even greater tension later. That comedic timing served him well in his various other roles as well, but he could do flat-out comedy excellently (such as in The Comedy of Terrors, with the absolutely hilarious Peter Lorre). 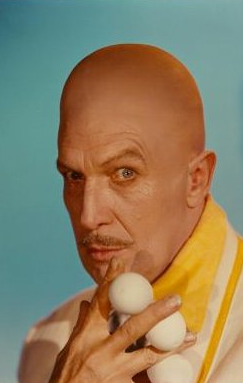 Plus he could reach outside of the horror genre into action/comedy (playing the villainous Egghead in Batman) and of course straight theatrical roles, playing Cardinal Richelieu in an adaptation of the Three Musketeers, and Bakka the Master Builder in the Ten Commandments. He could even go for an entire film without speaking (the two Doctor Phibes films, wherein Price acted entirely in pantomime, save for some voice-over work that was as absurd as it was creepy). He defined the "maniac killing people in bizarre ways" genre, and in his way set the stage with Phibes and Theater of Blood, wherein he played the scorned actor Lionheart, killing people according to the model set forth in Shakespeare's plays. I would argue there would have been no 80's slasher movie craze without those groundbreaking efforts. What many don't know is that he was a gourmet cook, and accomplished art critic and collector (he had a teaching job in art history, and wrote several books on the subject). All in all, a terrific actor, and one who really does define the horror film genre.